If you are like most people I know, the thought of spending a day in back-to-back meetings can be a dreadful feeling. Meetings can be boring, are often unnecessary and definitely take time away from other (more crucial) work. But meetings can be very efficient and productive when they are planned right. Here are some simple steps for planning effective meetings. First, decide if planning a meeting is really necessary. We often think a formal meeting is the best way to share information or have a discussion. But if your news can be delivered via email or conference call, or just by rallying a few people in your office for 15 minutes, then it's probably a good idea to skip the formal meeting altogether. Ever been invited to a meeting and wondered halfway through why you're there? Don’t waste people’s time by inviting them to a meeting they don't need to attend. That will not be an effective meeting. Does someone from accounting need to be present at the meeting to answer budget questions? Then invite one person from accounting who is suited for that task. If a colleague or supervisor needs to be informed of what was discussed at a meeting, you don’t need to invite them to the actual meeting. Simply prepare a meeting summary and send it to them afterward. They will appreciate the time saver, and you have the assurance that — because you put the information in writing — they are fully informed of discussions. Life is busy and calendars quickly become booked with scheduled activities. Send out a follow-up meeting reminder two days before your meeting. Those who said they would attend will then be able to confirm they can still make it, or if their plans have changed and you need to reschedule. To plan effective meetings, you should first decide what will be discussed. What is the objective of the meeting? What are you seeking to accomplish? Develop a meeting agenda ahead of time and distribute it to attendees. Indicate the start time and include a short list of topics to be addressed. Don’t bog down your own meeting with a lengthy, overly detailed agenda. Indicate by name any individuals who will be responsible for reporting on a specific area. Remember, this is important for those attending, but also for you, too. When you set out your agenda, you'll be better able to stay on topic. When you first send out notification of the meeting, be clear about its purpose and your expectations. Will the meeting revolve around a presentation? Will those attending need to take notes? Or is this a brainstorming session everyone is expected to show up with ideas and suggestions? In some corporate cultures, employees don't need to participate — they only listen and head back to their workspaces. In other companies, employees participate freely. In today’s collaborative workplaces, interacting and sharing ideas is not only welcome, it's frequently the purpose of the entire meeting. When you're setting out your expectations, it's also a good time to send out any required reading or material you'll want those attending to look over. That way they're prepared when they get to the meeting and there are no surprises. Starting on time is really important, both from a logistic and productivity standpoint. 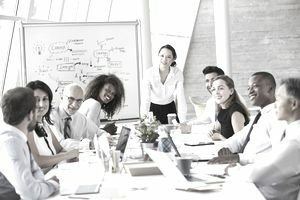 If you are the person who typically shows up for meetings on time, then you understand how frustrating it can be when things don't get going as folks trickle into the room. What inevitably happens is, going forward, everyone knows that these meetings never start on time so everyone starts showing up late. Take charge of your meeting. Start promptly at the given start time. Shut the door and begin. Stragglers will quickly get the message they are arriving late and they should only make that mistake once. And besides, everyone has to get back to work, so you don't want to disrupt the entire workday. Most meetings are slated for an hour when, in many cases, a shorter time period will suffice. When too much time is allotted, time is wasted. People linger after the meeting is over or spend too long on a given agenda item. Keep meetings short and to the point. Sitting in the same familiar conference room gathered around the same familiar table is just that — it's just too familiar. To encourage employees to interact, think creatively and have lively discussions, consider taking the meeting outside of the standard conference room. Consider meeting at a table outside if venue and weather allow. Try gathering in a common area with sofas and small tables instead of a large conference table and swivel chairs. If the approach to the meeting isn’t working, don’t be afraid to switch course. For example, if a brainstorming session is yielding a quiet room with very little dialogue, change direction. Be flexible and pay attention to how the overall meeting is progressing. Computers projected onto large screens and Smart Board presentations that encourage interaction are a welcome change from the standard lengthy PowerPoint presentations. One point on technology — be sure to test it out first. The last thing you need is to get flustered because the laptop isn't working or you can't run through your visual aids when you need them. If technology isn't your forte, have someone else do a run through before the meeting. It'll definitely save you time and keep you on schedule if you do a little prep work ahead. Within a day after the meeting, send out a brief summary of what was discussed. It's a good idea to follow up with an email to all those in attendance, those that were unable to attend the meeting and anyone else who may need to be informed. Also include any action items, specifying who is responsible for each item as well as the due date.